For almost ten years, computerised jewels have had it rough. Countless gamers, cell phone owners and bored white collar workers have made it their mission to line them up in rows of matching colour and destroy them. 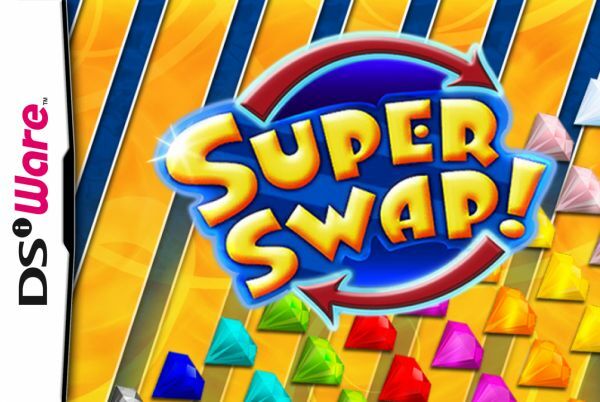 Now with Super Swap, even more jewels risk losing their lives to the technological menace that is man. Players slide jewels and other shapes about with the stylus, trying to line them up with their identically coloured brethren. When you connect three or more in a row, they disappear. Objects balanced atop their vanishing friends then fall and form possible combos with their new column-mates. Did we mention that it's a Bejeweled clone? There are four modes of play: Classic, Speed, Rows and the ominous Death Mode. In the first, objects fall in waves, and you're tasked with swapping them around before they're buried by more descending shapes. They pile up to cover both screens, and once they reach the tip top, it's game over. When you score a certain amount of points, you advance to the next level. Speed Mode is similar, but here the relentless waves never cease their plummeting; Death might in a different game be called "Endless Mode" as it's just one continuous level. Finally, the most interesting method of play, Rows, is like a combination of Bejeweled and a Rubik's Cube and feels quite akin to Tetris Attack. This approach involves sliding entire lines about and matching up objects by colour as you do so. Here, players advance to the next stage by scoring enough points within a time limit. There are three difficulty levels, which are all about as evenly spaced and challenging as they ought to be, though sometimes medium feels a bit too easy. Still, things get harder as each game progresses, so this won't be a problem for very long. 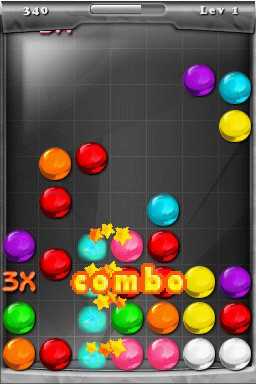 Adding to the fun are special pieces – some simply multiply your score while dynamite eviscerates all objects of the matching colour and a bomb will destroy everything within a small radius. Additionally, bandages litter each stage – you can't destroy them except with a bomb, and you can't swap them around. This adds an extra bit of challenge (more pop up in the harder difficulty settings, as well), and they add the most interesting factor to Rows Mode, wherein one of these will halt the movement of everything that shares its horizontal or vertical column. There's also a local high score list ten spaces strong for each mode that displays the amount of points and difficulty level at which they were attained, so you'll be able to compete with your friends. The controls require some precision; you must click and hold one object with the stylus, slide it to the place of another and release. While this may be a bit frustrating at first, we found that it ultimately adds to the experience. Each match becomes not only an attempt to do well, but to avoid panicking when times get stressful as maintaining a steady hand is a must. Of course, it's also a heck of a lot of fun. 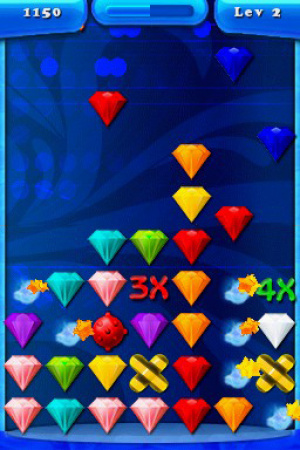 As we pointed out in our review of Bejeweled Twist, the game takes its inspiration from what's arguably the most important puzzle game since Tetris. It couldn't have garnered that status without being hugely entertaining, and nine years after the original's release, it's still as fun as ever. It's also incredibly easy to pick up and play, a virtue that's certainly contributed to its staying power. Presentation is one area in which Super Swap really shines. The objects are bright and clear, the menus are attractive and simple, and there's a great deal of customisation. You have the choice between six different item sets (yes, one is a jewel), four different background colours and the option of displaying a grid behind your pieces. If you don't like the way it looks, just change it up! There's a combination here for everyone. The sound effects are also a plus, providing an extra bit of entertainment and polish without becoming a nuisance. On top of this, the music is perfect: the menus are scored by a funky upbeat tune while the levels themselves use a soundtrack from the under-represented genre of nature/techno/birds in a space factory. All at once it's dissonant, catchy, relaxing and, what's most important, unobtrusive. It may be a clone, but this is a well-made clone of a great game. With four modes, including one quite different from the other three, and three difficulty levels, there's something here for everyone. While it doesn't do anything particularly interesting for the genre or the nine year old game that it emulates, it does a great job of presenting us with something that we already know and love. When I swap jewel across more than one row/column, the jewel always left behind and I swap another jewel instead. That's pretty frustating on fast level. Like Planet Puzzle League? I love it, but I will be saving some for 3DS titles. This looks like a great time killer; thanks for the review. Will probably check this out. I should also point out that you are only able to swap two pieces with one another at once, not move one across a whole row. But I know what you mean. Another great rundown, Zach. Totally agree. Wow. I totally DISAGREE. Boring presentation and all the modes seem too familiar. Not enough customization or save options (can't save in the middle of a game.) These modes/games are just too easy, and the difficulty level seems stuck on "EASY" this is an excruciating game to play since you can't save in the middle because it NEVER ENDS. Seems like a simple flash game that you can get free anywhere, nothing special about it. In fact, I think the reviewer here must have been rating a different game altogether. As a longtime puzzle fanatic, this just stinks. I'd rather play Extreme Hangman! lol I give it a 2/10. I agreee with GrumbleGrumble and I haven't even played the game. If this game is THAT easy, and you CANT SAVE during overly LONG levels, forget this. Does the game even track scores? Does it have multiple player profiles? Can you enter name into scoreboard? I'll stick with the originals and other clones. @supercommando440 No, there is no way to save in-game, a shortcoming that may turn some players off, though I did not find the levels overly long - quite short, in fact. However, I greatly disagree with grumble's evaluation of this as too easy. I actually found Super Swap quite rewardingly challenging. As mentioned in the review, it does track scores and you can compete with your friends with the high score list that it includes for each mode, ten spaces apiece. Of course, you can enter your name into this. Everyone is entitled to their own opinion, and this will not be everyone's cup of tea, especially if they're bored of the Bejeweled-type game. As for me, I can say this: In the past, I have never had any desire to play a game that I was assigned to review after reviewing it, even when I really liked the experience, but I've played Super Swap every day since. Super Swap used "Spare Time Eater!